Blurb: The Sisters Hemingway: they couldn’t be more different…or more alike. Three sisters, Hadley, Pfeiffer, and Martha, have reached a crossroads in their respective lives and now, on top of that, their Aunt Bea has died leaving them their childhood home in Cold River, Missouri, a place they wished they’d never returned to. Here they must confront their past and all of the things that have separated them over the years. 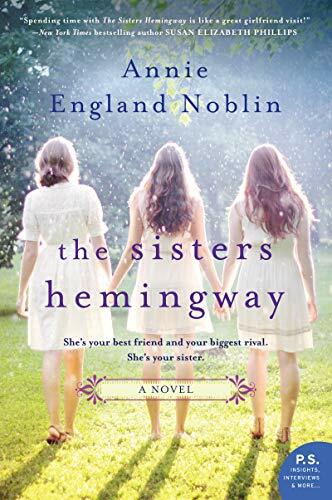 The Sisters Hemingway by Annie England Noblin is well-written and intriguing. While the blurb suggests that there is some mystery associated with the way the sisters’ mother and youngest sister died, that really isn’t the mystery at the heart of the novel. In fact, I’m not sure why it is suggested that their deaths are a mystery at all. The real mystery, which I won’t supply since it’s not mentioned in the blurb, will probably be one that readers will quickly guess the answer to, but will find fascinating nonetheless. While I enjoyed reading The Sisters Hemingway, I reached the end wanting more, which made me wonder why. The story was satisfying, but breaking up the narrative among the three sisters left me wanting to know more about each of them (more Pfeiffer and Martha than Hadley; being in DC leaves me never wanting to know more about congressmen and their wives). I liked Pfeiffer and Martha enough that I would have enjoyed an entire novel about them. And, this is not to mention the fact that I found the most intriguing sister of all was Mary, who may have been able to communicate with the natural world but died at the beginning of the novel. How cool a novel about her would have been! These observations lead me to conclude that The Sisters Hemingway is more of a plot-driven than character-driven novel. Regardless, I think most readers will find The Sisters Hemingway compelling and worth reading. I would recommend this to readers who enjoy women’s fiction by Susan Wiggs. Indeed, and butterflies seem so much more interesting!!! You didn’t mention the basset hound! You are right. There was actually a lot to talk about and I wanted to be careful about spoilers, but I could have mentioned the basset hound who has a cute place in the story. PS. I like the new blog look/layout.